It’s hard to avoid stains, but there are simple ways to remove them. So don’t panic when you see marks left by red wine, grease, or make-up. Use our tips to remove stains quickly and easily. Let’s begin with the two basic principles of stain removal. 1. Different types of stains need different treatments. Red wine stain or grease spot? Not every product can remove both types of stain. So it’s a good idea to think about the kind of stain you want to treat. Then you can choose the right stain remover for the job. 2. The sooner the stain is treated, the better. Dye, grease, and other components in the stain cling to textiles and work their way deep into the fibres. The more time the stain has to act, the more chance it has of sticking permanently. Coloured stains, in particular, should be treated as quickly as possible. If you’re out and about, at least rinse the stain in clean water. Tip: You can also try putting some sparkling mineral water on the stain. What’s the best way to remove each type of stain? Don’t worry—you don’t need a degree in chemistry to treat stains correctly. There are three main types of everyday stains: grease stains, coloured stains, and pigmentation spots/dirt stains. Sometimes, a stain falls into more than one category. One such example is a tomato sauce stain consisting of both grease and colouring. And don’t forget the second basic rule: the sooner the stain is treated, the better. A little water and a stain remover like HEITMANN Gall Soap can work wonders. Let’s take a closer look at the different stain types. These stains are caused by grease and oil—for example from butter, margarine, olive oil, mayonnaise, face and body cream, and lubricating grease. Soaps and detergents containing surfactants release grease from the fibres and emulsify it (disperse it in the water). You can remove grease and oil stains using various products. We recommend HEITMANN Gall Soap stain removers. HEITMANN’s stain salt and Oxi products are also extra tough on stains. Pure soda, a tried-and-tested household remedy, also dissolves grease from textile fibres. A lot of stains are caused by natural colourings, such as those contained in fruit, vegetables, juice, jam and marmalade, baby food, coffee, tea, and red wine. These stains fade when treated with active oxygen, an oxidising agent. Active oxygen is also effective on stains caused by yellowing or nicotine. Remove coloured stains with a stain salt or Oxi product from HEITMANN. 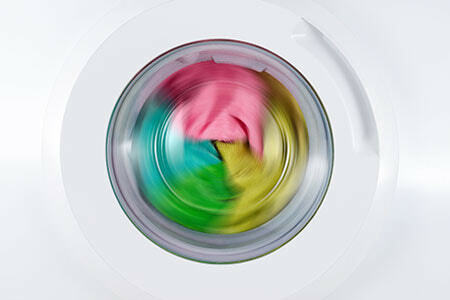 Our whiteners are ideal for removing yellowing from your white laundry. For coloured laundry, use one of our Oxi products and follow the instructions for use. Don’t apply it directly to coloured laundry. Pigments are coloured substances that aren’t soluble in water. In many cases, pigmentation spots also contain grease. These stains are caused, for example, by cosmetic products—such as foundation, powder, eyeshadow, and lipstick—as well as cocoa, mud, and soil. HEITMANN Gall Soap is ideal for pretreating these stains. Mixed stains are made up of various types of stain—for example, dye and grease. Stains caused by sauce, ketchup, grass, and ice cream fall into this category, as do most coloured pigmentation spots. The most effective way to remove mixed stains is with soap and active oxygen. Use a stain salt or Oxi product from HEITMANN to remove mixed stains from your clothing, right down to the fibres. HEITMANN Gall Soap dissolves the stain and supports the washing process. Some stains should be treated carefully to avoid accidentally making them worse. Protein itself doesn’t necessarily cause stains. But if the protein congeals, stains can fix onto fabric fibres. So your first step to tackle stains containing protein should be to rinse with cold water and HEITMANN Gall Soap. Treat with clean, cold water and a little HEITMANN Gall Soap. If fresh blood stains are treated with hot water, the protein in the blood congeals and fixes the colour to the fibres. Don’t use Oxi products on these stains. Iron, which is naturally present in blood, can oxidise and cause rust spots. Sun cream stains are very difficult or even impossible to remove (this is usually mentioned on the packaging). Detergents or other products containing whitening agents can actually make the stain worse. Rust spots can only be removed using special stain removers for rust. Treat the clothing before you next wash it to prevent the rust spot from becoming permanent. In these situations in particular, speed is of the essence as the colour forms a permanent bond with the fabric very quickly. Rinse immediately with lots of cold water. You can also add a little HEITMANN Gall Soap. A decolouriser sometimes helps when treating white laundry. You need a special stain remover for these stains. They should be treated before the next wash to prevent the colour becoming more firmly bonded to the fibre. Take the pain out of stains in four simple steps. If you spill some sauce or red wine, dab it carefully. Scrape baby food off carefully with a spoon. Don’t rub the stain—otherwise, the colourings and grease will get worked into the fibres. 2. What type of stain is it? For the best results, choose the right stain remover for the type of stain. 3. Take the time to pretreat stains. Pretreating stains is worth the effort. HEITMANN offers lots of practical products to help you tackle stains the right way. 4. Put it in the wash. Now it’s time to wash the fabric. To remove small stains, rinsing the area with water may be enough. But in most cases, you’ll need to wash the pretreated textile with detergent. You can hand wash the item or, easier still, wash it with other laundry in the machine. Tip: Don’t put it off. The fresher the stain and the quicker you treat it, the better your chances of removing it.